As you must know chocolate contains essential elements and nutrients such as iron, calcium and potassium, and vitamins A, B1, C, D and E. Cocoa powder is also the highest natural source for Magnesium, its deficiency is linked with hypertension, heart disease, diabetes, joint problems and pre-menstrual tension. It is a pre-menstrual drop in progesterone levels which is responsible for the violent mood swings familiar to so many women and their families, adding magnesium to a diet has been proved to increase pre-menstrual progesterone levels, reducing or eliminating the problem. There are benefits for men too, as well as the high magnesium content, beneficial for the heart and hypertension, the fat in high quality plain chocolate can be considered cholesterol free, as studies indicate it does not fur up the arteries or contribute to high cholesterol levels. Chocolate is good for our mental health, it contains seratonin and phenylethylamine both are mood lifting agents found naturally in the human brain and released when we are feeling happy or in love. Chocolate is also an excellent nutritional source, a single chocolate chip can provide enough energy for the average man to walk about one hundred and seventy feet or fifty metres. For nearly one hundred years the British and many other Armed Forces around the world have issued soldiers with 'Iron Rations' of chocolate containing very high levels of cocoa solids for use in emergencies. Even Napoleon carried chocolate with him on campaigns. Chocolates, both the commercial variety and, sadly, many hand made chocolate varieties, are one of the worst culprits, with centers consisting almost exclusively of flavored commercially produced Fondant and Pralines - Fondant is virtually 100% sugar and Pralines aren't much better. If you love chocolate and chocolates, there is good stuff out there and it is getting more plentiful by the day, as chocolate lovers become more and more discerning and demand for the real thing grows. 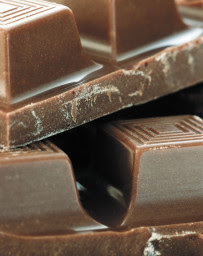 For the healthiest way to eat chocolate and satisfy a craving, you just have to be more discerning over what you buy.